I've enjoyed all of FUNimations One Piece releases, and Season Five Voyage Two contains some great episodes including the most touching and heartbreaking tale yet. But this set is marred, though no fault of FUNimation, by being bloated with several clip shows. These recap episodes aren't that helpful in these days of DVDs and streaming, but they do save money on the animation. The collection is still worth picking up because of the great Enise Lobby saga, just plan on skipping over more than one installment. The previous set ended at just the wrong time... the story of Nico Robin's past was just beginning to unfold. Now, at long last, fans who have been following the show on DVD can find out the rest of the story. Remembering when she was a little girl, Robin recalls how she became an archeologist, the fate of her mother, why she's interested in Poneglyphs and what happened to her home island of Ohara. It is also revealed just why every group of crew that she joins befalls a horrible fate and why she has no friends. This is one of the darker stories that One Piece has told up until this point, but it's also very good. Her story only lasts a couple of episodes, but it answers a lot of questions and explains Robin's behavior and attitude. Just make sure you have a box of tissue nearby when you watch them. The last episode dealing with Robin's background ends on a really high note. The Straw Hats know what they have to do and are incredibly determined. 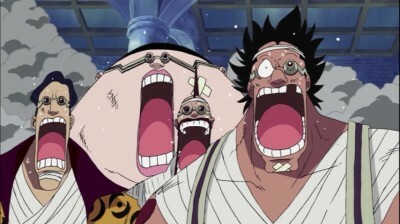 Luffy announces that they are going to save Robin, and by the looks on the other pirate's faces, you know he's right. You almost feel sorry for the CP-9. The music swells and the familiar "To be Continued" sign takes over the screen. And then... we get five recap episodes! One would have been okay, and two is pushing it a lot, but five?!!? That's just outrageous. Yes, there is a sliver of new content in the clip shows, but it's not very much and when we finally do get back to the story all of it is repeated at the beginning, so you won't miss anything by just skipping them. I'd recommend doing that unless you want to revisit how Luffy became a pirate and how he recruited all of his crew. Despite my righteous indignation, FUNimation did the right thing by including these. I do want all of the episodes uncut, and I don't want some executive trying to guess which ones I can live without. 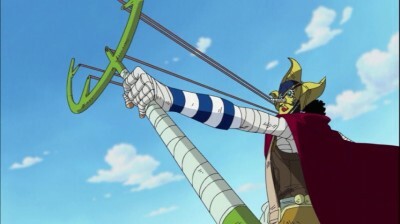 I'm just really disappointed that the Toei decided to string so many clip shows together and that they placed them in the middle of a story arc. Couldn't they put them between two sagas? Alternating with the clip shows are five short installments of Straw Hat Theatre. These 3-minute spots take place outside of One Piece continuity and are just silly little diversions. 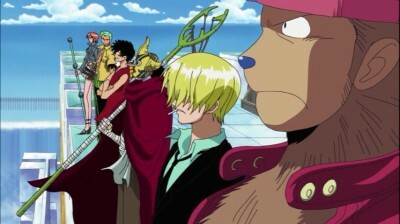 One imagines that the crew are mafia bosses, another that Chopper is a superhero and a third wonders what the show would be like if the Straw Hat Pirates were middle-aged women. They're funny, but easily forgettable. After that we finally pick up the story again. 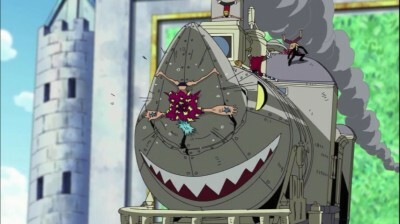 Luffy and his gang finally take on CP-9 and try to rescue their captured teammate. But with two of the members of CP-9 having just eaten Devil Fruit, they'll be harder to defeat now, and the Straw Hats weren't able to beat them the last time they met. The story is very good, what there is of it. Excitement, humor, and more than a little heartbreak make this a great story. It's just too bad that over a third of the episodes are basically filler. This set contains the next 12 episodes (276-287) on two DVDs, each in its own thinpak case. The two cases are held in a nice slipcase. This set offers the original Japanese track in stereo as well as an English dub in either stereo or 5.1. While the 5.1 dub was nice during the battle scenes, I preferred the original language track. The voices just seemed to fit characters better and made for a more enjoyable viewing experience. The English voice actors did do a good job however and people who like watching in English shouldn't be disappointed. The full frame video looked pretty good overall. The colors were bright and solid and the blacks were nice and inky. The image was generally sharp too. The only real problem was a more than average amount of aliasing. Diagonal lines are often jagged and when the camera pans across a scene, fine lines tend to shimmer a bit. There's also a bit of cross colorization, but it wasn't distracting. As with the other volumes, there's a "Marathon Play" option, which lets you watch the show without the opening and closing credits. That's really cool and something that all shows should offer. There are commentary tracks to two episodes, but they don't really excite me. There is, however, a pair of extras that I did enjoy: interviews with the voice actors. These segments, going under the title On the Boat, had some solid information about the actors and how they see their roles, and they were interesting. This time around we're treated to talks with John Swasey (Crocodile) and Stephanie Young (Nico Robin). The roughly 15 minute talks are hosted by ADR Director Mike McFarland and he asks the actors about the auditioning process, their favorite moments, and how they think their character has changed over the course of the show. The story is just as strong as ever, and Nico Robin's background story is one of the better ones in the series... but the five clip shows that pop up in the middle of the story knock the rating down a bit. It's still worth picking up, but just realize that this set will zip by pretty quickly if you avoid the very skipable recap episodes. Recommended.